What Was Your First Lamy? My first Lamy was a Yellow Safari with chrome clip and a medium nib. I was immediately hooked! 14 Lamy pens later, am still buying them. My first was a Vista with F nib. Very smooth writer. I ought to ink her up; it's been a while. Subsequently I bought a 2000 with F nib and then a NOS Lamy 99 with M nib. Love them all. Happiness is an Indian ED! My first Lamy was only purchased a month ago, it was also my first fountain pen since my school days, a Lamy Safari Charcoal EF. It's pretty much love, we go everywhere together. I lucked out that the Lamy rep was actually in the store when I went to buy it, so she rummaged through the stock to find one with an EF nib as none were on display despite them having a huge wall of them. Of course now I have the bug and want them all, several Al Stars are in the post on their way to me. A yellow Safari that became stained by Baystate Blue. I have the Lamy Vista! My first Lamy was a 2K that I lose few months after. Then I get a Persona, and three 2K now. All are great pens. Lamy black titanium oxide Persona, OB 18 K nail. ... no line variation. 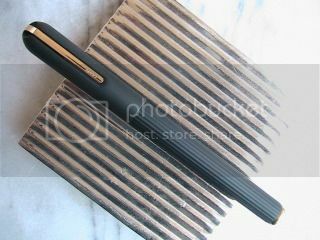 Very nice Art Deco style, by a famous designer....look up Lamy ...Muller? After the 'worthless' no line variation at all....made only for some one who cant's their nib nail was made CI by Pendelton Brown. Then and only then did the pen come out of the box. Since then with the CI grind, it is always in rotation....even if not used as much as the others that switch in and out of rotation. The Persona was designed by Mario Bellini. Red Lamy Safari with F nib (now 1.1mm stub). I do like it as a knockabout pen, survives drops well and is robust enough for environments I wouldn't want other pens in. May purchase a Lamy 2K if I can find one to try once I've saved up enough. Lamy 2000 in EF, bought to be a bulletproof workhorse that would be nice to use. Exceeded expectations! I began my descent into madness with the Ocean Blue Lamy Al Star a month or so ago. I have since added the Purple, Blue-Green, Graphite, Aluminum, and "Pearl" to my collection. They're like peanuts . . . I just can't stop . . . I need help . . .
Don't even get me started Yaakova, I've already picked up the Matte Black and Pearl Al Stars too with plans to get all the other colours I can lay my hands on. The idea of Ocean Blue with Baystate Blue is becoming a mild obsession for me but the bank account says it has to wait til next month! I started out with a charcoal Safari with F nib. I later picked up a few more ... Safaris in black (F), blue (F), neon coral (F), neon yellow (F) ... Vistas in XF and 1.1mm ... Two Al-Stars in purple (1.5mm and F). I have a spare M nib floating around somewhere. A 2k is possibly in my not too near future (I'm broke and need to save up). *hangs head guiltily* I just order the Coffee Brown Al-Star from Germany. Addiction is not pretty. Or cheap. P.S. I'm jealous of your Black Al-Star. I bid on one last weekend, but the price got too rich for my purse. Edited by Yaakova, 17 October 2014 - 03:09. A local pen-shop in MX still has some stock of Al-Star matte black pens (or had a couple weeks back, haven't checked since). The going rate for the pen is $780 Mexican Pesos -some $60 USD. If you are interested, I can get it for you, just let me know. That's very kind of you, but I'm afraid it will have to wait at least until next month. My bank account is telling me that I have enough pens for now. Black Safari with a medium and fine nib. I got a white one with black clip and nib today. My first, and only, was a Vista. I don't like the feel of the material, but it is superbly engineered. 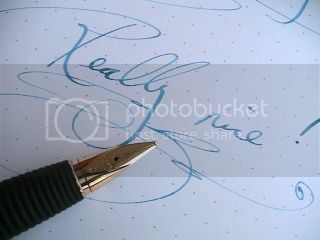 No part is redundant and no parts can be combined without severe compromise to the pen. The quality of the moulding is a study in precision. The professional engineer in me adores it. The pen user is less enamoured. The 1.5i nib wrote with the width I like (leaving a 1.1mm line), after swapping out the 1.1i, as I was getting a 0.8mm line. The polycarbonate (PC) of the Vista is the base material used in the 2000 (though there are additives and glass fibres not present in the Vista). I have already mentioned that I don't like the feel of PC in my hand, so I've had to conclude with regret that I shall not be getting a 2000, despite the fact I rather like hooded nib pens. 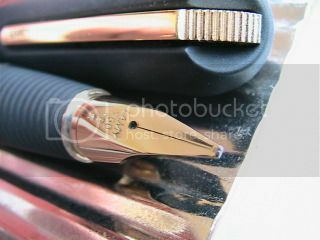 My first was a charcoal safari, followed a few months after by a stainless steel Studio with the 14k gold nib. Edited by siopaopei, 20 October 2014 - 17:55. My first FP ever, purchased this past February is a red Safari with XF nib. It got me hooked on FP's. It has been continually inked and in my purse everywhere I go! I liked it so much I bid on and won a Vista with an M nib on ebay about a month ago to ink with a different color. Don't sweat the small stuff....and it's all small stuff.